It will be at least a year before the slabs I recently milled will be dry enough to use, so I purchased a few slabs from an Austin based Sawmill called Greenwood Milling and made a Live Edge Waterfall Coffee Table. 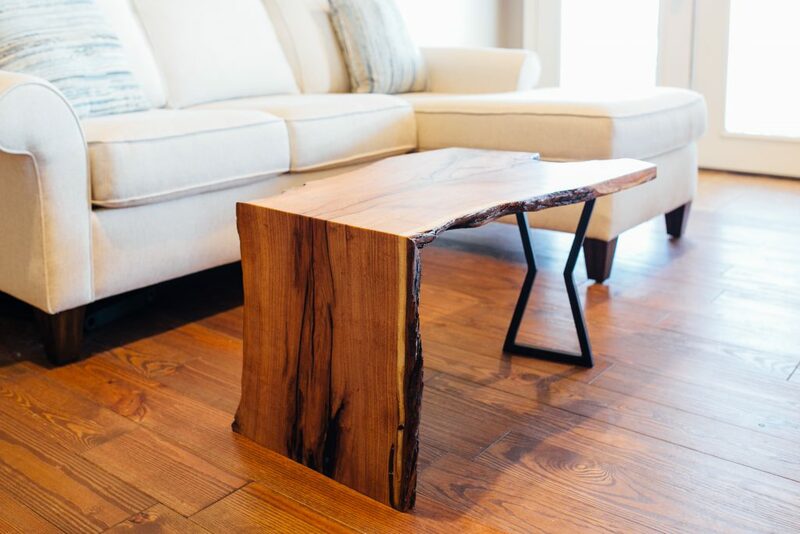 It’s called a Waterfall Coffee Table because you cut a portion off and that turns into a leg. But you do it on a Miter so the grain is continuous from the top onto the leg. First step in the process being to fill in the many cracks the slab has, with epoxy. I first flipped the slab over, using Painter’s Tape to tape off all the cracks and holes I could see. This is so as I start pouring in epoxy it won’t of course just fall through the other side. I got a lot of recommendations from Instagram viewers that Tyvek Tape actually works better for this job. It apparently removes easier, so you may keep that in mind if you do this project. Next was to flip it back over and start filling in cracks and crevices. For this I’m going with a Two-To-One Epoxy made by Total Boat. The Two To One number means that it’s Two Part Resin to One Part Hardener in each mixture. However, something I really like about the Total Boat System is their pumps are designed to make this a lot easier for you. They simplify it to one pump, to one part, and the pump dispenses the two to one ratio for you. After following directions on the stir time, I started pouring the Total Boat epoxy in the cracks. Also on the end crack, I again used painter’s tape so the epoxy would have a stopping point. There are a lot of epoxy choices from which to choose but the Total Boat System is very good at self-leveling plus it’s extremely clear. On that note you could tint the epoxy if you prefer it not clear. I’d pour it into the cracks until they had an overflowing amount of epoxy on top, then move onto a different area as that settled, coming back with a Heat Gun to rid the epoxy of any air bubbles. Once it had settled a bit more, I’d fill it up again, continuing this step until the crack stopped taking epoxy. If you are needing epoxy, go to TotalBoat.com and be sure to use Coupon Code April W to get 20 % off your purchase. On top of the 20% off, it ships FREE within the US, AND this Coupon Code is valid until December of 2019 so you have an entire year to utilize it. Now, onto flattening the slab out. I started off with my large Triton random orbital sander. On this Triton Sander there are two settings, a more aggressive setting and also a more gentle one. As I have a lot of epoxy to remove, I started with the more aggressive setting. This made quick work of leveling it out, switching then to the more gentle setting, to run along the entire live edge. Next, I cut in the miter that will drop off the portion of the table that will become the leg. Using my Track Saw I got a Square Cut on the end of my slab. Not having a true reference to be square, I eye-balled it by using a square against my Track, lining it up to what looked like a straight line down the center. This will at least get me close to where I can pull two tape references off this cut, setting up my track to cut the 45 degree angle. I tilted my Track Saw over to use. As a note, the Triton Track Saw has a foot you can move over into the track, to keep it from falling off the track as you are cutting at a bevel. Instead of trying to do it all in a single pass, I cut three different passes. I’d make a pass, set the depth a little bit deeper, make another pass, then repeat. With the hardest part done, I started joining these two pieces together. Using the Triton Duo Doweller, I removed one of the router bits to make it a Single Doweller. My join is at a 45 degree angle so I set my fence depth and also the plunge depth to match. Beware, you are going in at an angle and you do not want to plunge through your entire work piece. After setting the tool up, I put together my slab, marking off where I wanted the four dowel placements to be cut in. Although a simple tool to use, I still took my time ensuring 1) seating the work piece properly at the 45 degree angle and 2) making sure both the fences were flush against the work piece that was actually plunging in the bit. Before laying down any glue I attached what’s called Glue Up Cauls. These Cauls are made of plywood and used solely to make clamping down this joint much easier. Grabbing a piece of scrap plywood, I cut it down the middle to a 45 degree angle. Next I took these and glued them to my work piece with the 45 degree angle, away from the joint. Not having a lot of time to wait on glue to dry I used the Titebond Quick and Thick as it has a very quick set time. I left that to set up for a few minutes and started working on the dowels. Anytime I’m using a dowel for a joint I put in a spiral cut in order to give the glue some place to go whenever you put the dowel in the hole, so it doesn’t seize up. There are a few different methods but I used the Band Saw with my Miter Gauge set to a 45 degree angle, very gently rolling it as I pushed it through the blade at the same time. Once the Cauls were dry I flipped the slab over and applied Painter’s Tape right up to both these 45’s. This prevents a lot of hard clean up work once these slabs are actually joined. I personally went with Titebond II and first placed a liberal amount of glue inside each one of the dowel locations. I then hammered the dowels in, covering the rest of the joint in Titebond II, then started putting things together. The Caul’s outside cut of 45 degree matches the miter joint which gives me two parallel surfaces to get a good clamp set, using the clamp strength in order to fully seat and tighten this joint. I absolutely love this trick. After allowing he glue to set up overnight, I removed the clamps and started the clean up by first removing the tape from inside the 90 degree angle. Clamping down the workpiece I removed the plywood Cauls. One reason to use plywood is you can shear down the layers. I found it best to use two chisels to work down the length of the plywood until the entire piece pops off. However, it was suggested after doing the glue up that many people lay down Construction Paper, Parchment Paper, or even Painter’s Tape, in between the caul and slab to make removal the caul even more of a cinch. After removing the majority of the caul, I used a chisel to get rid of the bulk waste then used my Sander to completely clean it up. Since I was sanding I went ahead and sanded the entire piece to prepare to Finish. I started with about 80 grit to remove the plywood then went down to 120 and then finally 220 grit. Cleaning it to get all the fine dust off, I set things up to start begin Finishing the table. As I will be Finishing both sides, I set the slab on top four Bench Cookies with the pointer’s tip. I first Finished the inside of the table. After the underside was coated, I flipped it around, using a 2 x 6 to prop it up then repeated the steps for the top surface. I personally am using Minwax Wipe On Poly. I love this finish as I find it the easiest one to use and not mess up. It’s very good at self-leveling and doesn’t leave a high glossy, plastic look to your piece after it’s done. It is very quick to dry but also very durable. I just pour it directly on my work piece, using two paper towels to smear it around nice and even. The bark of my piece is a bit rough so I switched to a brush to get into all the nooks and crannies of the bark area. You need to wait about two – three hours before re-applying another coat of finish, so I started working on the other leg for the table. I originally was going to go with a wooden, mesquite trapezoid. 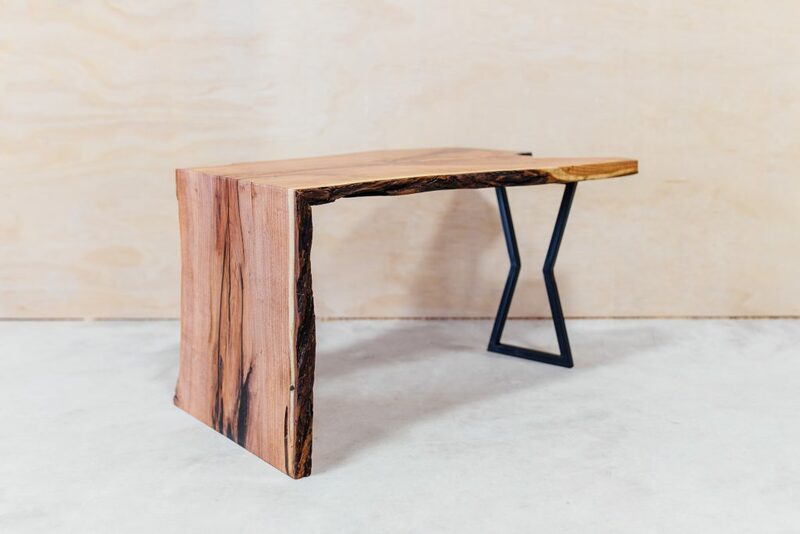 The trapezoid is normally the go-to leg for this style of table but after thinking about it, I decided to go with a Bow Tie shaped leg instead. Not a solid Bow Tie but just the outline of one. As the Mesquite piece I milled last week will not be dry for another year, I decided to make this leg from some ¾” Square Tubing I had. I first drew this leg to its exact size on a piece of Construction Paper, then took it to my metal working side of my shop, cutting the ¾” tubing to the size needed on my metal cut off saw. I cheated by simply placing the ¾” Tubing down on the drawing and used a Square to mark off where it needed to be cut and at what angle. This not only worked great but also very quickly. After cutting all six pieces needed, I first tacked them together, coming back to weld each joint closed. I welded them closed not so much for strength but as I wanted to paint the leg, I did not want to be able to see through an open joint. I also wanted it nice and smooth so I next grabbed a grinder, grinding down each seam so it appears the bow tie was made of one solid piece of metal. Just a tip, if you end up doing this you can see that the top and bottom horizontal pieces are the top of those vertical pieces. For this method I cut some pieces and capped off the end. However, if you switch the orientation and make the vertical pieces extend past the top and bottom, you can avoid this step. Last thing step to this leg welding wise, I cut some very thin Flat Stock, mitered the ends just to give it little bit nicer look, then tacked and welded it into place as well. This creates a wider footprint on the underside of the table. After sticking that into place, I used a scrap piece of wood on my workbench, drilling three holes across the entire length. By now the first coat of the Minwax Wipe On Poly was dry on the table so I sanded it all down, using 320 grit Sandpaper, prepping it for the second coat. Not being able to resist attaching the leg before doing it, just to see how it looked. I used the three hole locations in the bottom of the Flat Iron in order to attach it to the bottom side of the slab. I then continued on with Finishing of the slab, all total doing three coats of finish for this table. AIthough I made this small coffee table for my chaise Lounge, keep in mind you can do the same process for any table, whether an Entry Way Table, a Desk, End Table – there are simply no limits. Although a relatively quick project, it is certainly a fun one. I hope you enjoyed this project. I will see you soon.